Aiguillette: Originally, the word "aiguillette" referred to the lacing used to fasten plate armor together, specifically a metal end to the lace to stop it fraying (cf a moderm bootlace) it is used like a needle to pull the thread through loops. A knot or loop arrangement was used which sometimes hung from the shoulder. The breast- and back-plates would be attached on one side with short loops of cord acting as a hinge, and on the other by a longer and more ornate tied one. (As with boots, the longer the lace, the less the need to undo the entire lace.) As armour became more ornamental and less practical, so too did the ties. This explains the aiguillettes of varying levels of complexity in the uniforms of the British Household Cavalry (as opposed to other regiments that have never been armoured). An aiguillette is now an ornamental braided cord most often worn on uniforms, but it may also be found on other costumes such as academic dress, where it denotes an honour. Also called aglet, aiglet, anglet. Ailettes, ailets: (Fr. "little wings") small square shields applied to the shoulders worn during the 13th century. Commonly worn by crusaders. They were often painted with a heraldic device. In 1313 when Piers Gaveston wore a pair covered in pearls.nThey are sometimes shield shaped and sometimes circular. Not popular after the mid-14th century, although they still appear on many military uniforms. Some extravagant ailettes on the funarary brass of- 'Humbert (Humbiers) Corbeau (Corbeaze) II, sire d'Awans (c 1298), Église Sainte-Agathe, Awans, province of Liège, Belgium. Aketon, acton, arming coat, auqueton, gambeson, hacketon, haqueton, wambais, wambesium, wambs: A kind of coat worn during the 13th - 15th century both as a complete armour unto itself and as padding for additional armour worn over the top. They were generally quilted, either sewn or stuffed with linen, tow or even grass. Most of the illustrations from the 14th century show many buttons or laces up the front, and there are examples that feature a high collar to assist in the defense of the neck. 14th century Aketons were generally cut wide around the arm holes in a manner that followed the line of the breastplate or cuirass. These extra-large arm-holes served to grant complete mobility for a full range of arm motion while providing a last-ditch defense of the area under the arm. See also the pourpoint, a garment worn under the arming coat useful for attaching the laces for the attachment of a leg harness. 1350-1400 Aketon shortened and begins to be worn under the jupon, sometimes the only body defense. Strongly wasp-waisted form common to the period. 1350-1400 Sleeves were sometimes "banana sleeved" or ballooning out or were narrow so as to fit under the arm harness. Both seem popular for the entire period. Anneal: The process of softening metal. For ferrous metals, that is those containing iron, the process involves heating the steel up to its critcal temperature and then slowly cooling it. For non-ferrous metals such as brass, bronze, silver, gold, aluminum and the like, the process is the opposite. The metal is heated to the critical temperature and then quickly quenched in water, snow, urine, or oil. On a molecular level annealing allows the metal crystals to realign, moving them into their more relaxed state. When the metal is worked, the crystals are moved out of alignment, contributing to both hardness and brittleness. Practically, in the production of arms and armour the metal must be annealed as it is worked, otherwise the metal might stress enough that it will crack. Arbalest: (Fr: arbalète, Ger. Armbrust, Crossbow) The correct term for a crossbow, introduced early in the 14th century. The crossbow consisted of a bow mounted on a stock that could be cranked or pulled into place using more leverage than could be used on a conventional longbow. The result was a very high-powered, lower trajectoried weapon of great destructive potential. It fired a bolt, a shorter version of an arrow.The firing time on a crossbow was slow compared to the longbow, and for that reason and owing to the vastly higher expense during the period, the longbow remained the favoured missile weapon of the 14th and 15th century in England and in France. From time to time the crossbow was banned by various laws, but it remained a weapon of great popularity during the late 14th century in the low countries, the Swiss states, in Germany and in Italy. Arbalestier: A crossbowman or wielder of a arbalest. During the 14th century they generally wore a mail hauberk to defend the body, a bascinet to defend the head, sometimes with a collarette of iron to defend the throat. Almost always a footman, the crossbowman sometimes wore a surcoat bearing the livery of affiliation. During the 15th century the hauberk was generally replaced with a brigandine and the use of a pavaise, a head-to-tow shield, was often brought out as a semi-portable defense that the man could hide behind as he reloaded so that he would not be cut down by arrows, other crossbow bolts, or by charging horsemen. Archer: A man wielding a bow, an early form of artillery used with great effect during the Hundred Years War by Edward III. Most archers of the 14th century were armed with a padded jupon, mail shirt, or light brigandine. Some also carried light swords and helmets such as the chapel de fer, but the majority were probably barely able to field more than themselves, a knife, and their bow / quiver of arrows. Gradually replaced during the 15th century by the Arbalestier (crossbowman) and in the 16th century by the rifleman and cannon, the use of archers was a first step towards combined arms in an era dominated by heavy cavalary. Masses archers could destroy a mounted unit of cavalry or infantry if they could get in enough volleys before being crushed underhoof. Arçon: A saddle-bow, the piece rising in the front of the saddle. Arm Harness: All of the elements used in the defense of the arm. Under the armour might be an aketon or gambeson. Prior to the 14th century, the arm was defended by a mail sleeve over an aketon. The early 14th century saw the enhancement of a couter added to protect the elbow point. During the middle of the 14th century this couter was attached by rivets and lames to the vambrace which defended the lower arm and the rerebrace that defended the upper arm. Generally the resulting "arm harness," in one piece, was laced to the gambeson by a point from the top edge of the rerebrace at the outside of the arm. Over the rerebrace was then laid the spaulder, a defense that covered the shoulder and uppermost arm. This piece was also laced to the gambeson by a point along the top edge. This defense remained more or less constant during the 15th century, except that the wing was expanded in size to cover more of the inside of the elbow and the spaulder was sometimes expanded to become more cumbersome but more protective pauldron. During this period reinforces were sometimes fitted to the couter to enhance the protection for the joust. The 16th century saw an explosion of this kind of defense, but it was used only in the joust. Also during the 16th century, the size on the couter wing was reduced again and there was a brief flirtation with articulation on the inside of the elbow joint. 1300 three-piece vambrace, couter, and rerebrace dominate early experimentation with arm defenses. German and Italians use splinted defenses frequently, and examples in both countries often retain the three piece model even after the splinted defenses have been supplanted by plate. Italian, English and French development followed the following points, though there too the simpler three-piece model is sometimes found for the duration of the period. 1320 Earliest known defense known from the effigy of Don Alvéro de Cabrera in the Monastery of Santa Maria de Belpuig, Bellaguer, Spain. A splinted defense, three part construction. 1325-1330 Vambrace begins to be constructed in two parts, hinged and secured with buckles. 1330s on small plates defended the shoulder points, as found at Wisby and shown on contemporary effigies. These were often attached to the brigandine defenses or to the gambeson itself. 1330s Laminated spaulder shown on Ifield, Sussex (England), reinforced with disks bearing a lion mask, the same being attached to the couters. Spaulder formed in lames extends down the arm, permanently attached to the rerebrace. Couter often formed of smaller plates, rather than the pointed variety. Often rounded in shape. 1360 Couter is pointed in shape and is generally articulated with two or three lames, but sometimes no lames are present, generally attributed to Italian workshops as opposed to the German method of attaching the couter via internal leather straps. 1360 Disc-shaped couter wings give way to heart-shaped wings. 1360 Tulip-shaped vambraces formed in Italian examples, bulging to match the form of the forearm muscle and flared to accommodate the wrist. ~1360s developed the sliding vambracethat could turn in the articulation to accommodate a greater range of arm movement and a reinforce was sometimes added to the vambrace just ahead of the couter. ~1395 development of the pauldron, where the spaulder was enlarged to cover more of the armpit and part of the back and chest. Armed at all points: Ready for tourney or battle. Armed to all rights: Completely armed, fully equipped, ready for battle. Armet (à rondel): The dominant helmet during much of the 15th century, the Armet gradually evolved into the first truly international style of helmet, the close helmet. Armets were built of a snug-fitting bowl that came to just above the ears, fitted with cheek plates that attached by hinges to this bowl. Usually the chin pieces clasp in the front and secure in the back along a strip of steel that extends from the shallow skull bowl. The bowl itself is often reinforced with an additional layer of steel across the brow, and a visor fills in around the nose and eyes to make an exceptionally functional closed helmet. For some unknown reason, a disc of metal was sometimes attached to the back of these helmets; the purpose of this rondel is unknown. The armet succeeded the bascinet as the most common helmet in Europe, taking elements from the great bascinet. They were exceedingly popular in Italy, France and England, while the Sallet enjoyed great popularity in those regions and also in the German lands as well. Arming Cap: A small quilted cap worn under the mail coif that offered protection against blows and the friction of mail against the head. They seem to have fallen out of use by the beginning of the 14th century. Arming Nail: A word for rivet used in the making or repair of armour. Arming Points: Leather discs attached to armour so that it could be laced to the gambeson, hauberk, or another piece of armour. Generally these pieces of leather were relatively thin and flexible and featured two holes to allow a lacing to pass through and be tied off. Armour (Armor): The defense of the knight against the weapons of his opponents, consisting of his complete harness. Often this was used only to denote the "hard" bits of the harness, the hardened leather or plate defenses, rather than the softer arming garments, though sometimes layered cloth was also used as the sole defense, as in a jupon. I use the English spelling with the "-our" rather than the Americanized version to denote the difference between modern armored combat vehicles (e.g. tanks) and armour that is meant for the individual medieval soldier. Armour, buying: During the high middle ages, armour could be purchased from guild members in major cities, retrieved from less fortunate men-at-arms from battlegrounds, or imported from armouring centers, especially in Italy and Germany, both very high quality production centers during the period. Modern collectors and re-enactors have two main options. They can purchase real pieces from auction houses such as Sotheby's or Christies, or they can order reproduction pieces from the thriving artists working with tournament societies all over the world. If you are buying armour to use in a tournament re-enactment, be sure that you tell the armourer what use you intend to put the armour to so that appropriate safety standards can be met. Generally reproduction armour can be made in level of authenticity, detail, and technique according to both the skill of the artisan and the desire and/or pocketbook of the customer. Armour, collections: Around the world there are several well noted museums where the bulk of the surviving armour pieces might be viewed. Armour, decoration of: Medieval armour, even armour meant for war, was often decorated when the knight was wealthy enough to pay the enormous costs associated with such embellishment. During the 14th century, plate armour was rarely decorated. Leather armour was often tooled; some splinted armour might have been splinted with latten or brass. Part of the reason for this decoration was to display status and wealth, but another part was to offer insurance; a rich armour could be ransomed or led an opponent to believe that the knight had money to offer in exchange for his freedom should he be captured. See also Transitional Period for notes on 14th century stylistic elements. Adding brass, bronze or latten trim to the edges of pieces. Sometimes this trim was further embellished by the engraving of mottoes or simple patterns or, seldom, embossed. Use of heraldic color schemes coordinated with strapping to create a rich variety of colors and textures in a single combatants. Armour, as insurance: Killing knights who were opponents was not necessarily the rule in medieval conflicts. In war, a knight wearing an expensive harness might well be captured rather than killed both because knights tended to see themselves as a more or less homogeneous, almost brotherly class, and also because a rich suit of armour indicated that the knight had money-it was more in the financial interest of the capturing knight to take him alive and demand a ransom than to slay him outright and lose the ransom. Fine armour and horse both contributed to communicating this intent on the battlefield, though it was not always effective, as at Agincourt when more than 1,500 knights were slain outright following the battle. Armour, techniques required for building: A mixture of blacksmithing, silversmithing, and engineering, the armourer's chief tools would be of course the hammer and stake. Flat sheets of iron, generally purchased from a specialist preparing sheets for an armoury, would be cut into rough shapes. These shapes would be dished, raised, fluted and flared until they were generally in shape. Then they would be planished and bouged to smooth them out. Finally they would be heat-treated, sanded and polished. There is some evidence that forge-welding was being done during the 14th century; work done by the Swiss Institute of Arms and Armour in Granscay, Switzerland has published some excellent research on this. A modern student of armour who wants to get started should invest first in research books, to begin to train his eye; next in basic hammers, stakes and vices; then later in finish and welding equipment. See also Chronique: The Journal of Chivalry #6. Armour, weight of during the 14th century: The weight of the whole Churburg harness is approximately 28 pounds, including hauberk, but to this you must add another 6-12 pounds for the leg harness. Note that a full harness during the 15th century only averaged 56 lbs and that a modern infantryman's harness weighs approximately 55 lbs. And most of that is on the back, not distributed around the body. (See Malcom Vale, War and Chivalry) It is a complete myth that men had to be lifted into the saddle with a crane! Armourer (Armorer): The artist/craftsman responsible for creating armour. In the 14th and 15th centuries armouring was a highly sought after family business, where carefully guarded techniques made for a good deal of secrecy and national jealousy. Families such as the Missiglian and the Negroli and the Seusenhofers kept a huge industry alive for more than two centuries. Modern schools of armouring have produced similar stylistic families, with the "Valerius School" being the most prolific across the U.S.. We use the English spelling "-our" to distinguish from the kind of armorer who works on firearms who is a machinist-engineer/artist rather than a silver-/blacksmith / artist. See also Chronique: The Journal of Chivalry #6. Armourer, art of the: The ability to go beyond the craft of armour creation and to make an artistic statement that is communicated to the viewer through the piece. For more detail see the article in Chronique: The Journal of Chivalry #6. Armourer's Mark: The stamp that was placed on a piece of armour to signify the maker, much like a hallmark that is still used on jewelry. Sometimes three or four master's marks appear on a given piece, especially in the Italian examples where armour shops often had two or three armourers working on different aspects of the harness. Journeymen and apprentices do not seem to have had their own marks, and sometimes a family or guild mark is included as a statement of quality. In England there remain from the 14th century statutes that delineate which armour may be stamped and sold within London and which cannot. The city guild seems to have held a strong control over the import/export market by this "quality" filter that could be conveniently applied to reduce imports or restrict unguilded craftsmen. See Chronique: The Journal of Chivalry #6. Artillator: Maker of bows, arrows, and other archery goods. Ash, as a material for lances: Several chronicles mention that ash was used as the material for lances and pikes, because of its resilient quality and ease of availability in western Europe. Aventail: A skirt of mail attached to a bascinet or armet during the 14th and 15th centuries. It defends the neck from attack, usually hanging to at least 1" below the shoulder point for bascinets. Generally it was attached to a leather cuff that wrapped around the base of the bascinet and up the cheeks, which was pierced with holes and laced to the helmet through vervelles. Backplate: Armour for the back. See the particular kinds of breastplate, brigandines, cuirasses and coats of plates for a more detailed description. Baleyn: A medieval word for the whalebone used for weapons and armour during the 14th century. Barding: The defense for the horse, sometimes referring to the armour and sometimes referring to the cloth decoration that served to identify the owner. During the 14th century armour for the horse seems to have been usually restricted to the chamfron for the head and the crinet for the neck, but there are also references to cuirboille armours. No armour from this period has survived, sadly. During the 15th century, as the knight himself adopted the full white harness, the horse was also sometimes fully armoured. See especially the very fine example of a German "gothic" harness in the Wallace Collection, London. Barriers (combat over the): Depicted occasionally in manuscript references, most of the 14th century examples seem to have taken place during a siege. The gateway to a castle is opened, after a wooden barricade, resembling a conventional wooden fence, has been set up around the opening. This serves to keep the castle from being overrun during the "à plaisance" engagement. In the surviving illustration, knights compete with spears only, on foot. Some of them are wounded, but there are no serious injuries. During the 15th century combats over the barriers became a part of the pas d'armes, gaining in popularity as the century progressed. They remained in fashion even during the 16th century, when elaborate garnitures were constructed. Bascinet: The helmet that evolved out of the cervellaire, a small "skull cap" worn under the great helm, by extending the plate down over the neck and cheeks. Gradually the great helm was discarded altogether in favor of the bascinet because of the superior vision, glancing surface, and lightweight design. Early bascinets had no visors, but by the second quarter of the 14th century they were fitted with Klappvisiers, visors, using a centralized hinge system. Many of these hinges were easily removed, possibly meaning that they were intended to be discarded after the battle was joined. During the 1370s visors began to be attached to the side of the helmet, a more secure attachment system that often allowed the visor to pivot completely back around the helmet, meaning that it might not be lost in battle. During the 1390s steel ventails gradually replaced the mail aventail that had been fitted alongside the klappvisier to defend the neck, creating a new kind of helmet, the great bascinet, popular especially in the Hundred Years War in both France and England. Many examples can be seen in funery effigies of the period. This innovation of hinged neck defenses gradually evolved into the Armet, the dominant helmet of the 15th century. The bascinet itself was popular throughout Europe during the 14th century, showing a great variety of forms within the style. It is now the most popular helmet in the SCA because of the pronounced glancing surface, ease with which a grille may be attached and interchanged with a visor, superior defense for the head and neck, and sleek appearance. See Chronique: The Journal of Chivalry #12. Baselard: A knife or short sword bearing a hilt in the shape of the letter 'I', originating in southern Germany during the late 13th century. It quickly became the weapon of choice for many footsoldiers. Bastardsword: The modern word for a hand and a half sword. These blades, popular during the 15th century, were generally between 44" & 50" in length, but featured an extended handle that allowed the blade to be used in two hands, although it was short enough to wield one handed if required. Bâton: A tourney sword from the 14th or 15th century. There are several contemporary illustrations that depict knights fighting on horseback with such "wands," although in one of the primary references, King René d'Anjou's Livre de Tournoi, the author uses the word "masse". There is also contemporary evidence for these bâtons being made from ash or whalebone. There are a couple of references alluding to the use of bâtons in the vespers challenges, competitions for squires and young knights bachelier held the night before a larger tournament. These are referred to sometimes a behourds, and seem to have been fought in a friendly manner, to show prowess in front of the assembled knights. See also Chronique: The Journal of Chivalry #10. Besagews: Small round "shields" that were laced to the mail at the shoulder to defend the armpit. Developed as augmentation to mail defenses in the late 13th century, they faded in popularity during the first half of the 14th century, disappearing completely by 1350 as spaulders began to serve the same purpose while at the same time defending the shoulder joint itself. During the latter half of the 15th century they made a comeback, added occasionally to tourney garnitures during the early 16th century. Bevor, buff, bevier: A cupped defense for the chin attached to a gorget. Popular with sallets done in the German style, although they were also fitted to Italian examples, especially on armours intended for export. Black armour, evidence for: There seems to be some grounds to the rumor that the armour of Edmund, Prince of Wales, was actually finished with a black polish. Although he was not given the name "the Black Prince" until after his death, it is possible that this represents a finish used during the 14th century. However, there are hundreds of manuscript illustrations from the 14th century, and they almost always depict the armour as satin or gloss finished. During the 15th century black finishes on armour become commonplace in manuscript illustrations, although it is unclear whether this is paint or some kind of controlled oxidation process. Modern armourers have used black oxide finishes done through commercial houses to approximate this effect, but I have only seen one actual piece with something approaching this finish, a gothic composite harness held in the Metropolitan Museum of Art, C. 1480 or so. I do not know whether the finish is original or not. It is also possible that this is a rough finish direct from the hammer or from heat treating, left on low-quality munitions pieces to reduce costs. Blood Channel, Blood Groove: The erroneous name given to the fuller of a sword blade by more fanciful modern writers. Bloomery Process: Also known as the 'direct reduction' method of smelting iron, this process was known from as early as 900 B.C. The ore is heated in a low, cylindrical shaft furnace, constructed of stone, fueled with charcoal, and fanned with a bellows to a temperature from 1100-1220 degrees C and reduced directly to a spongy lump, producing iron ore and large quantites of slag. Though not discovered until the 15th century, this iron could be converted to steel by leaving it within the furnace for a longer time, so that the iron spent more time in contact with carbon monoxide gas. Body, defense of: Prior to the late 13th century, the knight defended his body with a combination defense of mail and underlying padded aketon. At the very end of the century we begin to find references to cotes of plates being occasionally worn in addition to the hauberk defense. By 1350 the cote of plates seems to have progressed more usually into a single globular defense, a breastplate covered or polished. By the end of the century, the breast and backplate had advanced to the point where they were fully encompassing, and with the addition of faulds defended not only the body but the hips as well. During the 15th century this defense was refined only by degree; the basic solution derived in the latter 14th century served well until the second quarter of the 16th C..
1275-1350 The cote of plates features the use of several large plates riveted to the inside, or very occasionally, to the outside of a cloth covering. 1335-1370 The globose breastplate develops, at first covered with cloth but later a polished piece of iron in one or more (often 2) pieces. Backplates still usually formed from several large plates covered in cloth. 1350-1380 Guard chains sometimes attached from the breastplate, sword, dagger and helmet to prevent loss. 1360-1400 Brigandines, derived from the cote of plates, also find wide use. The size of the individual plates decreases as the brigandine progresses, until during the late 15th century they become a coat using hundreds of very small plates, a jack. 1370's Cloth covered breastplates disappear, covered hip defenses now taking the form of faulds attached directly to the breastplate. Sometimes breastplates are worn without any additional defense for the back or hips except for that provided by the padded gambeson or jupon. 1400 The full cuirass is developed in all details. Bolts, crossbow: Shortened arrows used in arbalests, small stocky missiles capable of incredible penetration. Bombard: A piece of heavy ordnance for heaving stones used during a siege. Bosson: A 'battering ram' designed to pound down the gate on a besieged castle. Bouche: The small corner cut into the top of the shield to accommodate the lance, not popular until the 15th century. Bouging: The rough-finish process by which the larger lumps are taken out of a roughly shaped piece of armour left from raising or dishing. It generally takes 500-1000 hammer strokes to get a clean, bouged surface. Next the piece is planished, and finally polished. Bourdonasse: A long, elaborately painted lance designed to splinter on contact in late joust over the barrier. Brass (funerary brass): During the 14th and 15th centuries gisants or funerary brasses were often used as memorials for knights and their consorts. These plates were constructed in pieces of sheet brass and installed in the floor of a local church in remembrance of the knight's deeds. Often highly detailed, they are one of the better references for what armour looked like during the transitional period, when few actual examples of the armour have survived. One must use caution when dating armour using a funerary brass, however, because a knight was generally depicted in his own harness, which might be as much as forty years out of date at the time of his death. In modern times, these brasses have been the base upon which the popular brass rubbings are made, a process by which a wax crayon is used to take an impression of the knight. Many English and French churches produce income by selling finished rubbings of the brasses in their floors or sell the components and allow tourists to take their own rubbings. Breastplate: Originally evolving out of the cote of plates as the size on each individual plate increased and the front plate was increasingly globular, the breastplate was fully formed by 1360 or so but was not in wide use until the 1380s. This globular design provided an effective glancing surface that deflected both hand and missile weapons. During the 1360-1400 period it was seen both in the covered and open form, often worn over a gambeson, though it was sometimes worn under as well. There are illustrations that show the breastplate worn both over and under of an outer houpelande, but by 1400 the usual practice was to attach the breastplate to the backplate and provide faulds for the defense of the hip, the solution widely implemented during the whole of the 15th century. In the middle of the 14th century a "stop rib" was often added to the area just below the neck to keep lances and sword points from skipping up into the throat. During the same period, a lance rest was added to enable the knight to more easily couch the lance for a longer period of time. The edge around the neck and arm openings was rolled outward, sometimes over a wire, to guard against chafing and to help deflect a weapon from these vulnerable areas. 15th century breastplates increased the size of the rolls around the neck and arm hole, and experiments were made with making the breastplate from multiple pieces to increase the knight's mobility while simultaneously increasing the protection. Brigandine: Armour formed by the covering of small plates with cloth. Usually these were attached with rivets; an excellent and popular defense for the body and upper legs during the 14th century, as evidenced by the massive find at Wisby, where thousands of bodies were buried in a peat bog in 1365. Brigandine coverings might be used for body defenses, cuisses, vambraces; are easy to produce and to fit. Because of this, they were popular with the lesser nobility of Europe and the man-at-arms. Sometimes they were covered in leather, and other times cloth was used. The cloth could be painted or a bright dye could be selected to give an individualistic edge to the decoration. Brigandines should be distinguished from the Jack popular in the 15th century, a coat of cloth or leather lined with many small plates. Brittleness: The quality of metal that describes its likliness for the crystals to become detached, becoming a crack. Metal is said to be 'brittle' if it is likely to crack--this can be reduced by annealing the metal, allowing the crystals to realign. By their composition, some metals are more brittle than others: higher carbon steels are more brittle than lower carbon steels, though they are also harder, and brass is more brittle than bronze. Note that hardness and brittleness are distinct qualities, hardness referring to the metal's restistance to deforming and brittleness the tendency to crack. Broadsword: The general two-edged blade popular from the 6th century onward. Ranging in length from 30" to 42" in length, the average sword weighs only three to four pounds. Light enough to be used as a fighting tool all day, yet heavy enough to impart crushing impact along the edge, which was rarely sharpened. The weapons works by concentrating the force of the blow, the knight and the mass of the horse into the thin edge, often left to a thickness of between 1/16" - 1/8". The thickness at the center was between 3/16" and 1/4", and the blade generally started out from between 2-3" wide at the base and tapered gently to a point. See Chronique: The Journal of Chivalry #13. Bronze: Non-ferrous alloy of copper, tin and trace metals. Because of the copper base, bronze is very malleable and easy to work. Known interchangeably during the middle ages as latten, it was used for adornment and decoration of armour during the 14th century. Early man first learned to work bronze more than 10,000 BC, discovering that the metal work-hardens quickly under the hammer, making it a valuable metal for simple tools. Buckler: Small round "target" shield popular in Europe from the 13th to the 16th century. There is some doubt as to how often this shield was used outside of Scotland for war; there are many depictions of single combats using bucklers and sword or dagger, although these may represent combats over points of honor, or what we might more commonly know as "duels." Shields in use during the 14th century are generally not round, but they are usually the pointed "heater" shape we now associate with a "medieval knight's" shield and cote of arms. The buckler may well have originated amongst the Norse people, who in their repeated "visits" to England and the continent may have brought it with them and left it as a legacy in Scotland. Buckles: The most popular form of attachment of armour to a limb or another piece of armour was by buckle and strap or by lacing them to the aketon or hauberk. During the 14th century these buckles were often cast in bronze, and we are fortunate that many large deposits of such buckles have been unearthed in European cities during urban renewal projects. They seem to have been discarded with leather rubbish and preserved and are a reasonable artifact that can be inexpensively purchased by the amateur medievalist. Straps on armour were often finished with bronze caps that protected the end of the buckle and eased the arming process by providing a firm base that could be easily grasped. The other end of the strap was generally attached to the outside of the armour with a wide-headed rivet piened over on the inside of the armour. Some straps were attached to the inside of the armour and secured with a rough washer on the inside and piened on the outside, but this practice seems to have grown in popularity during the late 15th and early 16th century. Caltrop: Sharp spikes, resembling ‘jacks’ used to maim a horse. Robert the Bruce used them at Bannockburn, and there are references to spurs being used for this same purpose. Cap à pied: Head to toe armour from the sabaton to the helmet. Casque: The iron casque, the main head defense during the 9th - 13th centuries, was a rounded or pointed steel bowl that fit snugly over the head but was usually worn over a mail coif and arming cap. A strip of steel or other metal was often fitted to the front of the helmet to protect the nose, called a "nasal." Common examples of these helmets can be seen in the Bayeaux Tapestry. They evolved from the Roman legionnaire's helmet and the crude spangen helmets that replaced them as Europe rebuilt following the fall of Rome. During the early years of the 14th century most casques were replaced with bascinets as more defense was sought against arrows and the defense of the neck and head were enhanced. Catapult: A class of siege engines designed to throw spears and heavy bolts. Cervèllaire: The small skull cap worn under the great helmet during the last part of the 13th century and into the early 14th century. By the 1330s the helmet had evolved completely into the bascinet, displacing the great helmet completely except for use in some jousts. Chamfron: The plate defense guarding the horse's face. 14th century examples seem to be very rare, with little refinement, using globular pierced defenses for the eyes. The chamfron became well developed in the 15th century, when the horse was more fully armoured in plate. The Crinet, another portion of horse barding, defended the horse's neck. Chapel de Fer: Literally iron cap. This was generally a domed helmet, made in three or more pieces, with a wide brow around the outside. During the 14th century it was widely used by English and French men-at-arms and bachelier knights who could not afford a bascinet. Squires and other retainers probably also wore them, and they were often the helmet of choice amongst archers, since if an archer were to lower his head when a salvo of arrows was expected, the whole face would be momentarily covered. Chausses: Mail defenses for the thigh. Chevauchée: A burn and slash kind of war where the enemy army was lured to the field to protect the economic vitality of a region. It was used with great effect by the English under Edward III and the Black Prince during the Hundred Years War. Churburg, armor collection at: An extraordinary family collection housed in a castle on the Austrian border. Especially strong in armour from the 15th century, it also boasts the earliest homogeneous harness in the world, a 14th century armour including the hauberk, bascinet, breastplate, arm harness and plaque belt. All of the pieces are trimmed in brass and etched with passages from the old testament. The gauntlets are related but do not match the suit; the pair that match are in the Bargello collection in Venice, Italy. The harness is known commonly as "Churburg #13" after the catalog description and it is shown in nearly every armour book because of its rarity and quality. Even the helmet and breastplate linings are intact and the aventail actually matches the bascinet. Churburg #13: The first homogeneous harness, dating from the very end of the 14th century, housed in the famous armour collection at Castle Churburg. The harness has many very interesting features, both because of its high quality, unusual decoration, and intact condition. The pieces themselves appear to have been from the Missiglian workshops in Milan; they are commonly dated to 1390. The harness is complete with a camailed bascinet, segmented breastplate done in 11 pieces, complete arm harness, gauntlets, a mail hauberk, and knight's plaque belt. Claymore: The large two-handed swords popular in Scotland during the 15th, 16th and even the 17th centuries. Ranging in length from 50" to 72", they possessed handles that were 18" - 21" in length. Overall the swords weighed only six or seven pounds, although there are examples that are as much as ten pounds. These swords were popular also in Germany and in the Swiss states during the 15th and 16th centuries, although the term Claymore seems to have been restricted to Scotland. The term two-handed sword or greatsword seems more popular on the continent. Close Helmet: The first 'international' style of helmet, evolved from the armet during the 16th century. Close helmets were light, weighing from 3 - 8 lbs, featuring a single piece skull, a chin defense or bevor and visor both pivoted from a point somewhere above the ears. Although very close fitting, the name is a modern attribute. Coif: A Mail defense for the head in the form of a hood, often worn under a full helm. The mail coif was worn over a padded cap, providing excellent protection against both shock and penetration. Coronal: The head of a lance, fitted for the joust of peace instead of the sharp point used for war. Using multiple points (generally but not always limited to three) it spread the impact and reduced the damage. Cote Armour, jupon: A quilted garment worn over a breastplate or cote of plates or as the sole body defense during the 14th century. Such armours were popular in England since they required little technical skill to manufacture, were light and easy to transport. Popular amongst men-at-arms and archers-they were often worn with the chapel de fer for the defense of the head. Cote of Arms: A word that seems to have been interchangeable meaning a cote armour blazoned with a device or a surcoat bearing the heraldic charge of a man's affiliation. Because it was the most visible expression of a knight's arms, the word has come to mean the heraldic device itself rather than the cote upon which it was sewn, painted, or embroidered. Cote of Plates, Pair of Plates, Plates: A cloth or leather covered armour for the body with several large plates riveted underneath for the defense of the body. The most famous examples were unearthed at the Battle of Wisby site, dating from the mid-14th century. For the first half of the century they were made of flat plates, but gradually the breastplate was dished to conform to the shape of the body and the waist was drawn in for the characteristic "wasp-waisted" element of transitional style. Couter: The defense for the elbow, generally mistakenly called the "elbow cop" in modern SCA parlance. During the 14th century these were generally reasonably shallow, starting off rounded in the early part of the century and progressing towards a more conical but still rounded shape as the century progressed. In the second quarter of the century a "wing" was added to the couter to improve the protection for the joint itself, first affixed with laces, then with rivets, and finally, mid-century, was made integral to the couter itself. Wing decoration then flourished, with the shapes varying by region, date and fashion du jour. About the same time that the more conical shape came into popularity, possibly because of this need, the couter was during the second half of the century now articulated using two or three lames to attach it into a single jointed defense from the wrist (defended by the vambrace) and the upper arm (defended by the rerebrace). See Arm Harness for a more detailed description of the development. Crinet: The armour for a horses neck, not popular until the 15th century. It was made with overlapping plates from the top to the bottom, held together either with leather strips or by sliding rivets (the latter was much more common during the 16th century, when sliding rivets became universally accepted). Made of very thin steel, perhaps 22 gage, the plates were often fluted or flared for strength. Cuff: The part of the gauntlet defending the wrist, flared widely during the 14th century but becoming longer and more narrow during the 15th. Cuirass: The plate defense for the body. Introduced during the third quarter of the 14th century, it became the "cadillac" defense of the 15th century. Consisting of a breast and backplate, hoops of steel to defend the hips known as faulds, and tassets to defend the hips. During the 14th century, the breastplate was often made from a single piece of steel and the backplate from a brigandine, but during the 15th the breastplate was generally made in two or more pieces (especially in the German "gothic" examples) and the back in many pieces. The piecing yielded a good deal of increased mobility and made the harnesses much easier to produce. Italian cuirasses were often more rounded in shape, keeping with the Milanese school lines, formed of larger pieces of thicker steel. German models were sharper, formed of more numerous and thinner plates, often featuring fluting to increase the strength lost with the use of small, thin plates. Cuirboille, courboille: A material used for armour to add rigidity. It was made, by all accounts, by boiling or painting a heavy leather with beeswax, probably enhanced with other ingredients. I believe that there was a good deal more cuirboille around than has been recorded, in part because it would be very cheap for a medieval economy to produce and in part because it stands up very well to repeated blows. I believe that it might well have been far more common for squires and practicing men-at-arms or knights to wear cuirboille when practicing, then put on a metal harness à la guerre for war. Cuisses: Defenses for the thighs. During the 14th century cuisses were at first either leather, splinted leather, cuirboille, or quilted cloth. These defenses were often elaborately carved and studded, and probably painted as well. From the middle of the 14th century, these experimental materials for cuisses were frequently replaced by primitive plate. By the 1380s, the cuisse was often made from one broad piece covering most of the thigh and one or more smaller pieces at the hip. Arming points are provided at the top for the cuisse so that the cuisse can be laced to the arming hose or gambeson. This form of cuisse remained popular during the whole of the 15th century, divided in style according to the Gothic or Milanese fashion. During the 15th century a wrap plate was also added to the cuisse to defend the back of the thigh, especially as foot combat for knights became more common. The defense of the knee, the poleyn, was attached either to the cuisse directly (usually before 1350) or articulated using lames to create a moveable joint. The latter half of the 14th century saw also the development of full greaves used to defend the shin and lower leg, and sabatons for the defense of the feet. See also Leg harness for a more detailed and complete development during the 14th century. Dagger: A short pointed knife. There were many forms of daggers worn during the high middle ages; they are more frequently worn in illuminations than are swords, at least when knights and squires were at court. Dishing: The armouring technique in which metal is worked outwards to form a dish or bowl shape, known also as doming. The process is the most common technique used by modern armourers, and yet thins the metal. Raising is the opposite technique, by which the same shapes are attained not by stretching and thinning the metal but by compressing and thickening it. Dishing work is done from the inside and raising from the outside. Double Harness: Reinforced harness for jousting, originating in the 15th century. Although special armours for the joust begin to appear during the 14th century, it was not until the 15th when special harnesses began to have names other than 'armour for the joust.' During the 16th century the garniture, or special pieces for the joust, came into wide fashion. Some pieces of fine garnitures remain in the Royal Armouries collection and in several Continental museums. Enarmes: The straps on the back of a knight's shield. See Chronique: The Journal of Chivalry #8. Engraving: A technique of decoration common on silver and gold ware during the 14th and 15th century, used only rarely on armour during these periods. It was used with great effect alongside of etching, a faster but cruder technique, during the 16th century. The most famous 14th century example is from on the brass trim on Churburg #13, held in the Churburg castle, where phrases from the old testament are engraved into the border pieces. A very striking effect that has been very popular amongst modern re-enactors, although generally etching has been used for speed and efficiency. Epaule de Mouton: A steel defense for the complete arm, developed during the 15th and 16th centuries, used exclusively in jousts. The epaule consisted of a single piece formed to cover the whole arm, made of cuirboille or iron/steel. Etching: The technique by which a form of wax or resist is placed onto the metal surfaced and scraped off in preparation for an acid bath (generally nitric acid or a mix of nitric, sulfuric acids and water). The resulting effect is to quickly remove metal and produce a striking visual effect. Used most often during the 16th and 17th centuries, there are only scattered references from the 14th and 15th centuries, although the technique appears in common use in jewelry and art metal. Most decoration during these periods was restricted to engraving, painting, or studding. Eyes, defending: Prior to the 13th century, little was done to defend the eyes. The skull, cheeks and back of the head was defended early on by mail and casque defenses, but it was not until the development of the heaulm that the face was enclosed. After that, a narrow slit was generally provided to allow vision but to restrict weapons. On bascinet visors, the area around the eyes was raised outward to make it very difficult for a weapon, or more importantly, an arrow to find purchase on the iron and penetrate. Fabric, common types in arming applications: Linen was the most common material for aketons, gambesons, and arming clothes. Silk was also used, and there is a tale that says that this is because silk against the skin has a tendency to restrict the damage of a wound. 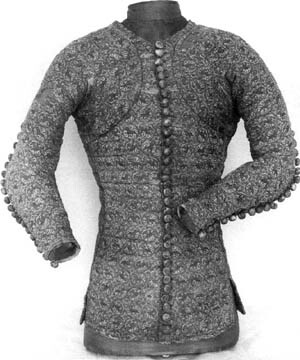 Wool also appears to have been common for cotes and overclothes, though few examples of arming clothes remain save for the cote of the Black Prince, in Canterbury Cathedral; the jupon of Charles the Bold; and a pourpoint from the 15th century held in the Kienbusch collection, Philadelphia. Falchion: A short, heavy, broad-bladed sword with a single edge, bearing a similarity to a heavy scimitar. Faulds: Hoops of steel used to defend the hips, abdomen and lower back; attached to a breastplate. Tassets extended downwards to protect the lower hips. Taken together with the breast and backplates, they formed the cuirass or body defense of the 14th and 15th century. 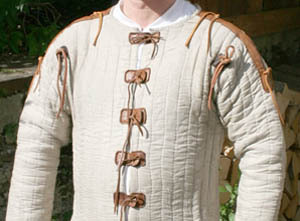 During the 14th century faulds were sometimes covered in cloth using many rivets, or sometimes to leather. The practice was continued into the 15th century with increasing rarity. Ferrite: A non-metallic, ceramic-like compound of ferric oxide found in iron. Ferrous: Metal derived from iron ore--pig-iron, cast-iron, steel. Flaring: The pressing of metal so that a lip or tail is formed into a compound curve with a concave shape, similar to the mouth of a vase. This technique is essential to making fine quality pieces that are free from the modern danger of being to flat. Barbutes, greaves, crinets, gauntlet cuffs, and vambraces all feature a good deal of flaring, making them difficult to execute. Without doubt flaring is one of the more difficult things for an armourer to learn, but it improves the quality of the resulting pieces by many times. Fluting: Ribbing which is hammered into armoured plates for strength. Popular in Gothic armour during the 15th century, it was occasionally used in armour from other regions chiefly on tassets and to reinforce the wings of poleyns. Fuller: The groove forged and ground into the center of a sword blade in order to lighten it. This was not used, as in common folklore, as a "blood channel" so that blood can flow off of the blade. Gamboised: A padded defense made of linen, flax or other fabric, sometimes reinforced and studded. Gamboised cuisses were often worn as an early addition to mail chausses during the late 13th and early 14th centuries. Garniture: During the 16th century a concept was introduced by which a field harness was fitted with an additional 20 - 40 pieces of equipment so that the same armour could be used for war, specialized tournaments, and the joust. Specialized armour for the tourney became increasingly expensive during the 15th and 16th century, although there are records of specialized armour pieces in wardrobe accounts of the 14th century. Gatlings: The small joint defense on a finger gauntlet, usually attached to a leather or canvas base by sewing or by rivets. They might have been of iron or latten; there is evidence for both. Some of these gatlings might have been cast into creature heads or other forms, such as the acorn, which was a very popular motif. See the gauntlets in the Bargello collection and numerous brasses for more detail. Gauntlet: The armour to defend the hand. Prior to the 14th century, the hand was defended with a mail mitten. During the first half of the 14th century, gauntlets were introduced formed of small plates riveted to leather or cloth, what we call a brigandine gauntlet. Only a few examples survive, all from the Battle of Wisby find dating from 1361. By the middle of the 14th century, the "hourglass" gauntlet had been developed, where the cuff flared to allow some wrist movement. Often the metacarpal (back of the hand) and the cuff were decorated with additional pieces in brass or bronze, and also by engraving. The fingers were defended either by scaled defenses and sometimes by gatlings, which were like poleyns for the finger knuckles. There are some references, most notably the Battle of San Romano, which indicate that this style of gauntlet might have been used, at least in Italy, into the second or even the third quarter of the 15th century. During the 15th century, this "finger gauntlet" style was replaced in the Milanese style with a three-piece "mitten" gauntlet that replaced the finger scales with two articulating lames that provided more protection but less mobility. The cuff was extended and straightened, losing the flare of the hourglass gauntlet. In the German style, the cuff was also extended, but the plates were ornately fluted and decorated with piercework. The Gothic gauntlet is made from many small plates intricately articulated together with a mixture of sliding and pivoting rivets. The fingers were still articulated using gatlings and scales. During the 16th century, this style was generalized into a more international style where the gothic cuff was shortened, the metacarpal created from as many as fifteen plates, and the fingers done in scale. A minor variant, the "locking" mitten , was designed for tournament use during the 16th century. No earlier examples survive, though there are references in manuscripts from the middle 14th century that mention such locking gauntlets. Gladius: The short thrusting sword of the Romans, developed originally in bronze but more effective in the later iron examples. These blades were short yet a little heavy, designed both for thrusting and for cutting in close-in combat. The gladius was modified for horseback into another, longer sword, the spatha, to which medieval swords owe most of their design qualities. Gorge, gorget, collar: The defense for the neck, a plate defense usually hinged on the left side and affixed on the right side with some kind of latch mechanism. These elements were unpopular until the late 15th century; 16th century examples were often fitted with a pin by which the pauldrons were attached. During the 14th century, the aventail defended the neck. During the 15th century, bevors were used in conjunction with sallet helmets and the face piece on the armet was fitted with a very short ventail. Gothic armour: The Victorian term for German armour from the 15th century, characterized by fluted surfaces in fan-shaped patterns, construction from small thin plates, with a linear design to the pieces. Gothic armour was generally cap à pied armour, very light for full harness, featuring a sallet and bevor for the defense of the head. Contrast this with the more curved and softer Milanese armour produced on the Italian peninsula. Grapers: lance against the body at the moment of impact, often cited in inventories but which are rarely seen. These are seen in an illumination elsewhere on this site dating from the 15th century. Gratz Armoury: The armour collection at Gratz, Austria, featuring one of the most extensive collections of 16th and 17th century armours in existence. The armoury represents a nearly intact municipal armoury, the only one of its kind. Only the Tower of London has maintained a similar arsenal. Great bascinet: A late 14th early 15th century version of the bascinet where the mail aventail was replaced with two steel plates, one in the front and one in back. During the middle 15th century these helmets were still in tournament use, fitted with grilles, adorned with brilliant torses, mantles and crests for the pageants sponsored by rich noblemen such as King René d'Anjou. See Chronique, The Journal of Chivalry #10. Greaves, shynbalds: Plate defenses for the lower leg also called. They first appear on brasses during the second quarter of the 14th century, and remain a standard defense for the lower leg for more than two centuries. The greaves were shaped, flared and dished to match the shape of the calf and ankle. One of the more difficult pieces of armour to create, the greave adds a very elegant look to any reproduction harness. Grille: A rare form of visor, a defense for the face, most commonly used on tournament helmets of the 15th century. The only surviving grilles are fitted onto great bascinets; such are amply described in King Rene d'Anjou's book on the tournament. There is a single example of a center mount bascinet from the middle 14th century on a Bohemian altarpiece, c. 1360, the bears a grille as defense. The grille has become a standard defense in the SCA, where modern re-enactors prefer the vision and breathing capability, not having to worry about sheared lances or the points of swords. Guige: The strap affixed to the back of the shield by which a shield could be carried over the shoulder. See also Chronique: The Journal of Chivalry #8. Hammer (armourer's tool): The predominant tool of the armourer. Similar in shape to the silversmithing hammers, armourer's hammers are normally 2-3 times heavier than a similar tool used to work silver. An even and accurate hammer stroke is necessary to the production of crisp interpretations. Modern armourers can acquire such tools through some blacksmithing supply houses or from European toolmakers such as Peddinghouse. Sometimes old hammers can be acquired, and modified if necessary to do the required task. A modern armourer will have from between 20 and 100 hammers that they use regularly, with most preferring 2 to 5 for most of the work and the rest serving specialized purposes. These are often bought from tool collectors or modifies to solve a particular problem. See Chronique: The Journal of Chivalry #6. Hammer (warhammer), Martel, Horseman's Pick: A weapon consisting of a hammer head on one side and a spike on the other, sometimes mounted on a short handle for use in one hand and other times mounted on a short shaft for use in foot combats. Warhammers and poleaxes were popularly used in judicial duels or in combats associated with points of honor. Hardness: The quality of metal that describes resistance to denting, scratching, or bending. Harness: The generic description for a man-at-arms defensive gear, including undergarments, armoured elements, and integral equipment such as spurs, sword, etc.. Field harnesses were armours of war, designed for use in the field. During the 14th century some specialization in armour was begun, where tournament gear first begins to be separated from field harness in inventory records. There may well have been leather gear also, used for practice, but this might not have proved valuable enough to record, though decorated tournament gear of leather was often recorded. Haubergen: A shorter version of the hauberk, a shirt made of mail, usually laced down the sides ofter 1300. Hauberk: A mail shirt, generally extending down to defend the legs. The hauberk was the main defense for both body and legs until the late 13th century, when armourers began to experiment with reinforcing using padded, courboille, and even rudimentary plate augmentations. Head, defense of: Generally a helmet was used to defend the head; a camail and casque or heaulm prior to the 14th century; a bascinet, cervèllaire, sugarloaf, heaulm or chapel de fer during the 14th century; a barbute, sallet, armet or great bascinet during the 15th century; an armet or close helmet during the 16th century. See also Padding, helmet. Heat treating: The processes through which armour is hardened through heating. In general, most iron or ferrous armour is hardened either through work hardening (done by hammering) or by heating it to its critical temperature (dependent upon the technique used) and then quenched in water, urine, oil or other more secret substances. Prior to the 14th century, most hardened pieces were worked, planished, from the hammer rather than heat treated. During the 15th century, there is some evidence that the German armourers, particularly in Augsburg, began to use a sophisticated two step method that achieved a superior hardness and a resiliance to brittleness. See especially Theodore Monnich's article in Chornique: The Journal of Chivalry #13. Heater (shield): The common form of knightly shield introduced from the late 13th century and used commonly all during the 14th century. During the second and third quarter of the century it seems fashionable for knights to carry very small shields, as the examples from existing brassesChronique: The Journal of Chivalry #8. Heaulm, Helm, Great Helm: A fully enclosed defense for the head developed during the 12th century. Known also as the "barrel" or "pot" helmet (modern terms), the heaulm was generally made from several smaller sheets of steel, completely covering the face. From manuscript accounts it appears that they were often painted in the colors of the knight, and might also have been washed in gold or adorned with brass, bronze or latten decor, generally in the form of a cross under the occularia and down the front of the face. Higgens Armoury, Worchester, MA: An extensive collection open to the public. They have one of the larger collections of 16th century Maximillian armour in the world, but few pre-16th century pieces. =Hips, defense of: The hips were defended both by the aketon, the hauberk, and after the middle of the 14th century by faulds. During the 15th century tassets were added to bridge the gap between the hip and the thigh. See also Cuirass and Body, defense of. Horse, defense of: Prior to the 14th century, horses were generally defended only by mail. During the late 14th century, there are records of horse armour but there are no surviving examples. Full plate defenses were occasionally used during the 15th and 16th centuries, although usually only a crinet and chamfron were used. Horse, use of: For most of the medieval period, the knight and horse combination formed the most awesome force the battlefield had ever seen. Using the stirrup and saddle, the knight and his fifty pounds of armour would bear down on the opponents with a heavy lance. The key to this attack was for a group of knights to charge closely together, the effect of which would completely unnerve the defenders and break up any who remained. Because this technique required such careful coordination, tournaments were begun during the 12th century. During the 14th century, the English first began dismounting their knights, defending massed archers to check Scots and French cavalry. Following the Battle of Halidon Hill, where the English first tried the technique with great effect against the Scots, it became a standard English tactic for the duration of the Hundred Years War. Following the war, the role of the footman, and particularly the pikeman and the introduction of gunpowder removed the dominance of heavy cavalry and reintroduced a more balanced approach to warfare. Houpelande: A garment common to the nobility during the very end of the 14th century and extending in various forms into the mid and late 15th century. It was characterized by long flowing sleeves, sometimes dagged in many interesting patterns. They were generally worn as court attire but a variety seems to have been adopted in place of the surcoat, particularly in Germany during the late 14th century. Hundred Years War: The war between England and France that lasted from the middle of the 14th century to the middle of the 15th century concerning the accession to the French throne and various holdings in France that had been under the control of the English crown. The techniques of warfare used, siege war, the chevauchée, and occasional set-piece battles were well recorded by Froissart and Engerrand de Monstrelet, two invaluable sources for study of the high middle ages. Hundskul: See Klappvisier. The pointed visor fitted to a bascinet. Indirect Reduction: A process through which steel is obtained from iron ore, used in northern France at least as early as 1451. The hotter fire of a stuckhofen would reduce the iron to a liquid, which could be collected on a bed of charcoal where a portion of the carbon would be oxidized and run off; the resulting material is steel. Also known as the Walloon method. See Chronique: The Journal of Chivalry #13. Iron, as a material for armour: Surviving in a limited form after the fall of the Roman empire, until the 12th century the use of iron was restricted to weapons, mail hauberks, and casques or spangen helmets. During the 13th century sources for iron became more plentiful, and during the 14th century it became commonly available for use by armourers. Recent tests by the Swiss Institute for Arms and Armour have shown that during the 15th century the use of steel, iron strengthened by the addition of carbon, was mastered by both Italian and German craftsmen. After the middle of the century most armour was made from steel rather than iron, making it more durable, resistant to rust, and more easily heat-treatable. Jambes: The part of a medieval saddle the was extended downwards to defend the legs. Using such defenses allowed jousters to avoid an additional leg harness. They came into use during the 15th century and remained in use on jousting saddles throughout the 16th and 17th centuries. Kienbusch Collection (Philadelphia): One of the most valuable collections in the United States, featuring many fine, unique pieces. Housed in the Philadelphia Museum of Art. 26th Street and the Benjamin Franklin Parkway, Philadelphia, PA 19130, Main Museum number, 215.763.8100. Website. Klappvisier: The first visored defense for the bascinet, originated in the German states. The klappvisier featured a pointed (pignose) or rounded (roundnose) snout to deflect arrows and bolts and a raised area around the eyes. It first defended the area of the face not already defended by the aventail. As visor design developed, the central-mount system gradually gave way to the side-mounted system that was to dominate for the next two centuries on bascinets, great bascinets, armets, and finally, close helmets. Knees, defense of: Defended by leg harnesses and poleyns. Lames: The term commonly applied to the plates added between major components to facilitate articulation. During the 14th century, this was generally accomplished with a maximum of three plates in the arm (two is better), and three in the leg. The vast majority of 14th century articulated harnesses use only two plates, and the author's handling of two examples indicates that most harnesses probably did not allow for a full range of motion. In all probability, the motions allowed were what was required for the prevailing combat forms of the day, and the styles were in turn probably influenced by the armour technology available. Most lames were formed from very thin iron plate, generally 18 or 20 or even 22 gage steel. SCA lames are formed from 18 or 16 or even 14 gage steel, depending on the style of the armourer and the location to be defended. In my experience, hammer-hardening lames helps to reduce the stress on the plate and gives it a resistance to tearing that helps a piece to endure. Additionally, most lames on the arms and the legs are rarely flat, as they are usually made in the SCA, but are rather slightly dished or flared. See also Articulation, Arm Harness, and Leg Harness for more details. Lance (weapon used in the joust): The long shaft of ash tipped with a sharp iron or steel tip, varying in length from 9 to 14 feet in length. A vamplate was developed near the end of the 15th century to protect the hand and arm, and lance rests were built into breastplates from the late 14th century onwards to help steady the lance as the horse galloped towards the target. Latten: Brass, Bronze or a mixture of the two. Generally a copper base metal with elements of tin or zinc plus other trace elements. During the 14th century latten might well have been used for select armour bits, such as knuckle gatlings, couters, poleyns, and for trim on armour during the latter part of the century. This trim might be further enhanced by engraving (especially Latin phrases from the bible or local mottoes) or by punchwork designed to emulate rivet heads. Leather, as a material during the 14th century: Before 1350, leather was a common material used to augment mail defenses. The vambraces, cuisses, and greaves were reinforced with leather that might have been something like modern sole leather, sometimes boiled or painted with beeswax (cuirboille) or sometimes simply shaped, and finished with something like lacquer. The chief piece of evidence are the funerary brasses of knights from the period, but these brasses do not help us to determine whether the defenses were gamboised (quilted), leather, or something else. Leg Harness: Referring to all of the armour pieces defending the knight's leg, including the cuisse (thigh), poleyn (knee), lames (connecting plates), and greave or shynbald. During the 14th century the transition was made from the mail defenses called chausses to the fully articulated leg harness, although the development was not even from place to place. By 1400 the fully leg harness had developed in the form that would survive until the 16th century. 1300-1350 Chausses still used to defend the leg, with the addition of plate or leather shynbalds to protect the calf. 1320-1360 Poleyns are laced directly to the chausse, defending the knee. These poleyns appear to have extended around the knee and to have provided a flared lower edge to ease the transition to the shynbald or chausses for the calf. 1320-1340 Poleyns are occasionally reinforced with the addition of a small rondel to the side, additional protection for the back of the knee. 1330-1375 The chausse is eliminated in some harnesses in place of a plate cuisse that defends the thigh. By 1375 this plate was made in a single piece and articulated with the poleyn through the use of two or three lames (only one lame is used to articulate the cuisse to the poleyn; two lames are sometimes used for the demi-greave attachment). 1340-1400 Instead of a rondel attached by a central rivet, the poleyn itself is extended to form a "wing" on the side of the knee cop, usually some variant on the heart shape. As the century progresses the poleyn is reduced in size and the wing flared in the beginnings of the very broad flair seen on 15th century leg harnesses. 1340-1400 Plate greaves become increasingly popular, being made in two pieces front and back, hinged on the outer edge and latching by snaps or buckles on the inside. 1375-1400 The full leg harnsses is complete and becomes fully adopted throughout Europe. Longbow: The weapon of the archer, used for launching arrows, developed in Europe. Compare it with the shorter composite bow of the Saracen, which had a shorter draw but was easier to use from horseback. Longbows were the preferred weapon of the English after the middle 14th century, Edward III recognizing the power of massed artillery (archers) used in combination with dismounted cavalry and infantry. The longbow, with a draw from 30 - 36", could launch an arrow more than 300 yards, deadly against opponents not defended by plate armour. Mace: A short mass weapon not unlike a heavy club. After the third quarter of the 14th century the club end was often made of metal and enhanced with metal flanges or spikes. Mail: Interwoven links of iron wire riveted together to form a kind of defensive metal cloth, highly resistant to slashing but less effective against piercing or crushing wounds. During the latter 14th and 15th centuries sometimes the riveted links were interposed with solid links that had been stamped to halve the production time. Mail was made by specialized armourers, and because it was easy to make, seems to have been manufactured all over Europe, first introduced by the Romans during the latter days of their empire. See also Aventail, Ventail, Coif, Hauberk, Haubergeon. Malleable: From the Latin 'malleare', to hammer, the quality of metal that allows it to be easily shaped or formed, by hammering or through pressure. Mantling: The cloth decor suspended from a helmet, commonly illustrated in armorial artwork. The most splendid references to mantling are to be found in King René's Livre Tournoi, where they are shown matching or enhancing the heraldic colors worn by tournament combatants. See Chronique: The Journal of Chivalry #10. Martensite: A component of iron useful for determining heat treating techniques used, it is a solution of iron and up to 1% carbon. Masse: The word used in King René's Livre Tournoi to describe the clubs used in tournament. I suspect that bâton is a better translation, looking at what the weapon actually looks like. See Chronique: The Journal of Chivalry #10. Maximillian: Armour created at the beginning of the 16th century for the Emperor Maximillian, characterized by armets and close helmets with bellows visors; small fan-shaped fluting often covering most of the harness (but never the greaves); etching, work taken from woodcuts; sharply waisted cuirasses and squared sabatons. Metacarpal: The defense for the back of the hand, usually a part of a gauntlet. Metallography: Microscopic examination of a metal's crystalline structure, used in conjunction with spectroscopy to determine the composition of a specimen's iron component and the methods by which it was refined (smelted) into a workable metal. The metal's crystalline structure are examined, using the ferrite, pearlite, and martensite crystal structures and slag content. It can also determine the armount of carbon present in the metal and the method used to achieve heat treating. Metropolitan Museum of Art, New York: Easily the largest collection of arms and armour in the United States, the museum has a substantial collection, of which only a small part is available in the new armour gallery that opened in 1995. 1000 Fifth Avenue, New York, New York, 10028 Website. Milanese: The descriptive term for Italian armour of the 15th century characterized by an organic, rounded line. Milanese armours are generally made from larger plates than their German gothic counterparts, have little fluting, and are more curvaceous. Milan and Venice were the major armour production centers in Italy, home to the famous Missiglian family. The barbute and armet were two innovations of this style; the barbute died out but the armet evolved into the close helmet during the early years of the 16th century. Military belt: References to the military belt go all the way back to the Germanic tribes described by Tacitus in the 5th century. 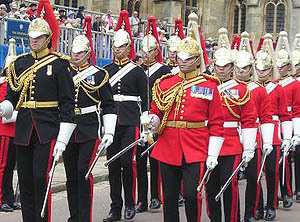 The military best seems to have been the predominant symbol of the military man for the whole medieval period. During the 14th century it took the form of a metal belt, sometimes white, with metal plates or plaques. The belt was given to a knight at the adoubement ceremony, usually by a respected knight or one who has close ties to the candidate, or occasionally, especially in the case of mass battlefield knightings, by a king or prince. Missiglia, armourer family: Active in Milan from the middle of the 14th century until the end of the 16th , the Missiglian family mark was known for quality and expense. The family changed their name during the 16th century and became the Negroli, but I am not sure how or why this came about. Mitten Gauntlet: A defense for the hand that seems to have originated in Italy during the early 15th century. Early mittens were formed from three main plates, one forming the metacarpal and the cuff (this was sometimes split into two plates joined at the wrist), and two plates articulated carefully together to provide a defense for the fingers. Scale pieces were added to the thumb as well. During the 16th century the mitten idea was used alongside of finger gauntlets in a more international style spun from a mixture of Milanese and gothic elements. Munitions Armour: Armour mass-produced for the common foot-soldier, increasingly available during the 15th, 16th and 17th centuries. Frequently this armour was sold 'rough from the hammer' without polishing, still featuring the hammermarks of the final planishing, accomplished to smooth out the surface of the metal and to provide for hammer-hardening. Musée de L'Armé, Paris: The national armour collection of France, the museum is especially strong in 16th century pieces, although they have a few very fine individual pieces from the 14th century, such as a guilt kettle-hat meant for Royal use; a full leg harness for a boy, and a very fine fragment of a sabaton. Musée de l'Armée, Hôtel National des Invalides, 51, Bd. La Tour Maubourg, 75007 PARIS, Tel: 44 42 37 67. Neck, defense of: During the 13th century, the neck was defended by a coif worn under the helmet. With the development of the bascinet during the 14th century, most knights wore aventails suspended from the helmet. Great bascinets replaced this aventail with a plate collar, also attached to the bascinet itself, then fastened to the cuirass. 15th century helmets used both aventails (on armets) and bevors to defend the throat. 16th century helmets usually used a combination of chin defenses and a gorget that defended the lower portion of the throat. Nock: Notch in a bow and in an arrow, designed to keep the arrow in its proper place for firing. Occularia: The eye slot of a helmet, after the Latin. Padding, helmet: Prior to the 14th century an arming cap seems to have provided the padding needed to line a helmet shell, but after this the padding seems to have been incorporated into the helmet itself. The bascinet on the Churburg #13 harness shows a rare example of an intact helmet lining-the pieces are sewn in linen and stuffed with the same, drawn together at the top of the helmet and the while sac affixed to the inside of the helmet, perhaps with some kind of glue or interior laces. In addition to linen, tow, grass or even sea sponge might have been used. Modern helmets are often padded in the same manner, except that instead of linen or tow, closed-cell foam is used, sometimes alone (ack!) and sometimes sewn into a lining (much better). Painting (armour): From the 13th century onward, painting seems to be a common method of protecting armour from the elements. Very common during the 13th, 14th and 15th centuries, less so after that, although the black-and-silver armour style of the 16th century used painted black surfaces contrasted with polished metal surfaces to achieve striking effects. Painting (shields): Shields were almost always painted to bear the device or a symbol for the combatant. Usually a heraldic charge, during pas d'armes and round tables in particular shields were sometimes painted with a theme appropriate for the occasion, such as an angel or a saint. See also Chronique: The Journal of Chivalry #8. Pavaise: A large rectangular or oval shield, usually as tall as a man, carried by infantry and archers to defend themselves from opposing missile weapons. Frequently used in sieges. The largest pavaises had props in the back to keep them upright. The finest examples I have seen are in the Tower of London. Used mainly in the 15th century. Pearlite: A mixture of ferrite and cementite forming distinct layers or bands in slowly cooled carbon steels. Pell: A post used for practising swordwork. A poem from the 15th century proves use at least from the high middle ages; targets may well have been painted or affixed to the pell to improve timing and accuracy. See Chronique: The Journal of Chivalry #6. Pien: To secure a rivet into place by hammering. A mushroom of the rivet material is formed and the materials to be joined trapped in between the rivet head and the mushroom. A round face is used to make the shape, and sometimes if a soft material is to be secured to a hard one (such as a leather strap to a piece of armour) then a rough washer might be cut and placed under the mushroom side of the rivet. Pignose: The modern name to describe a pointed bascinet visor, popular during the second and third quarter of the 14th century. The proper name is the hunskull. Pike: The long spear, with a small steel head. Up to 20 feet in length, they were popular with the Scots, Swiss and Flemings during the 14th, 15th, and 16th centuries. The use of compacted pikemen was a powerful counter to cavalry, but was usually checked with arrows or missile fire. Planishing: The final hammer work done on a piece. Anywhere from 1000-10000 hammer strokes are required to provide a smooth, even layer of faceted hammer marks ready for sanding and polishing. Additionally, if the piece is not to be heat-treated, then a complete planishing lends a good hammer-hardening to the piece, helping it to resist deforming under the stress of combat. See also Chronique: The Journal of Chivalry #6. Plaque belt: A military belt formed from interlocking metal plates or featuring metal plates riveted to a leather base. Common in the funerary brasses, very few real examples remain. They were generally formed from cast bronze, brass or latten, usually thick enough to give some value to the casting. Modern armourers have begun to make plaque belts for consumption by the tournament societies. Plate: A general term for iron defenses fashioned from sheet iron or steel. "Plate" defenses were during the Middle Ages first introduced during the late 13th century, first as reinforcing for mail defenses and later as defenses on their own. During the 15th century full 'plate' armour had evolved from 'cap a pied', from head to toe, weighing approximately 50 lbs--enough to protect the knight but light enough to allow quick movement on the battlefield. Note that the pack carried by a modern infantryman weighs approximately the same as a suit of medieval armour. Polearm: The general term for a group of pole-mounted weapons usually featuring a cutting or slashing weapon on one end. The halberd, guisarm, bill, bec-de-corbin, and poleaxe are all specific kinds of polearms, rising in popularity during the 15th century and into the 16th amongst the infantry. Poleaxe, pollaxe, polaxe: "A knightly staff weapon, its head being an axehead, usually balanced by a hammerhead, and surmounted by a steel spike. The shaft was protected by steel checks and the hand by a steel rondel. Used from the fifteenth century for foot combats and for war. The component 'pole' in the name refers not to the staff, but to the Old English word 'head. '"-David Edge and John Miles Paddock, Arms and Armour of the Medieval Knight. Poleyn: The period name for what is known in modern SCA verbiage as the "knee cop," the defense of the knee. During the early 14th century, rondels were laced to the mail to improve the defense of the leg and add to the defense offered by a mail chausse. By 1320 these rondels had been replaced by a fully-encompassing "gutter" around the knee itself, laced into place or attached to a leather or gamboised or splinted cuisse at the top and the same construction of greave to the bottom. By 1350 the poleyn was articulated with lames; a heart-shaped wing was then extended from the poleyn itself to provide more protection for the back of the knee. After this point the poleyn decreased steadily in size, providing for a better platform for the articulation of the joint. This wing expanded and, with minor variations, remained reasonably constant in shape (though larger) throughout the 15th century. 14th century poleyns were generally articulated with no more than three lames, one on top and one or two between the demi-greave and poleyn itself. See also leg harness. Polish, finish appropriate for the 14th century: We have only a few examples of how armour was finished during this period. Generally, it appears as a satin brushed finish, something you might achieve with thousand-grit sandpaper. Other sources speak of highly polished armour, "that glints in the sun." Still other armour was painted. The reason for this polish is that it resists rust, and that it imparts a glory to the pieces rarely seen in the modern world. It evokes the image of the "knight in shining armour," connecting the combatant with the romantic history that feeds tournament reenactments. To achieve this finish now, a belt sander with a 2" x 72" belt is the best thing I have seen, followed with a polishing wheel of 80 grit to a high stainless polish. Polish, maintaining (modern): We have found that the absolutely best thing is a microcrystalline wax, sold to museums and to furniture restorers as Renaissance Wax. Happich Simichrome is useful for removing light rust and cleaning the metal prior to the waxing (motorcycle shops often have it). Keep all pieces separated in their own bags (pillowcases work well), since scratching wears pieces more definitely than does moisture. Lastly, polish from time to time bringing the polish back up to a high gloss using a buffing wheel and greaseless compound. Polish, maintaining (period): Most period armour was maintained by squires or grooms who would go over the surfaces with a brush. More extensive work was probably done at a guildhall, where waterwheels could be used and coated with fine sand to act as sandpaper. Similar wheels covered in leather and painted with various compounds could easily polish armour in the same way that we can do now, but at a much slower pace. Mail was often placed into drums and dragged or turned, tumbling it with sand and vinegar to remove the rust. I can find no authentic references to the use of wax or oil in the care of pieces. Pommel: The end of a sword's hilt, a counterweight, frequently in the shape of an almond, 'wheel' or faceted element. Normally pommels were made from iron, left plain or adorned with washed gold, silver, enamels, or precious stones. Sometimes they were made from latten, and in a few instances they were even made from semi-precious stones. The pommel is an important element in the balance of a *sword, providing the right amount of counterweight to allow the blade to move easily in the wielder's hand. Pourpoint: literally "for points," an arming garment worn under or as an aketon in order to lace on the other armour bits. Quintain: A target attached to a pole, often rotating, used to teach accuracy in jousting. A poor hit often spun the pole to buffet the attacker. Raising (raised): The art of compressing the metal to form the desired shape. Raised work is done from the outside, over stakes, rather than from the inside. Raised pieces are very easy to keep symmetrical, have a strength not common to domed, dished and welded pieces, and are far more difficult to create. See books on silversmithing for the best instruction (but you'll need to anneal the metal differently and use much heavier hammers). Real Ameria, Madrid: The finest collection in Spain, featuring a large collection of armour from the 15th, 16th and 17th centuries. Rebated: Weapons with no edges or with the edges removed, used in tourneys a plaisance. Rerebrace: The defense for the upper arm, also known as part of the canon. See Arm Harness for development details. Rivets: Small "arming nails" produced iron, steel, or brass for the construction of armour. See also Articulation and Armour, techniques required for building for more information. Roberto di Milano, OL: Robert Mackenzie, one of the finest armourers in the United States, currently working out of Ithaca, NY, known for his extensive focus on absolute authenticity and his very high level of technical expertise. Rondel: A small disc of metal intended for defense. They are commonly found at the armpit (prior to 1350) when they are known as besagews; on a backs of armets (for an unknown reason) and rarely on the metacarpal of 15th century Italian mitten gauntlets. Roundel: The round metal attachment at the base of a polearm to keep the hands from sliding down the shaft and onto the blade, where they might be harmed. Roundnose: The modern name for the early German Klappvisiers, a bascinet visor attached with a central hinge featuring a rounded rather than a pointed shape. Rust: The brown oxidation that attacks armour when exposed to salt or moisture. Various strategies were used during the 14th and 15th centuries to defeat rust, including high polishes, painting, and blackening. Sabaton, Solleret: Armour for the foot, usually consisting of articulated plates ending in a toecap. Plate sabatons seem to have made their appearance in the middle of the 14th century, remaining in common use throughout the 15th and 16th centuries. In the early 14th century, the foot was defended by mail or scales, though no examples of these defenses remain apart from evidence on funerary brasses. Milanese armour from the 15th century generally used mail for the defense of the foot rather than the solleret; the reason for this is unclear, especially since armour made in nearly every other region of Europe adopted the sabaton long before this. Sallet, Salade: A common helmet of the 15th century, varying in style according to national preferences and rapid changes in defensive requirements. Most sallets are characterized by a flared tail, drawn out either from a single or several attached pieces. 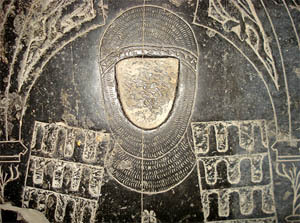 Some sallets were fitted with visors, while others were worn open-faced. Sallet design roughly followed the nationalistic style preferences represented by the Milanese and Gothic styles, though there was a degree of overlap as armouries strove to create pieces in competition with their rivals. There is no clear distinction between a sallet and the barbute or the armet; there are pieces that are clearly both a sallet and a barbute or an armet. Generally the sallet was a lighter helmet that was in common use amongst the soldiery throughout the period, while the armet and barbute seem to have been more popular with the nobility, at least in Italy. In Germany the sallet held universal appeal, while in England and France all three styles were worn, imported from continental armouries for the best quality. Shield (construction of): The knight's shield of the 14th and 15th centuries was generally formed from wood, covered in gesso, and painted with his heraldic charge. Often the gesso was raised to give some texture to the shield, the back was covered in some kind of cloth, and finally enarmes and a guige were added so that the shield could be carried. The shield weighed no more than 6-10 lbs, usually leaning towards the lighter number. Shield (knight's): Most knight's shields during the 14th century were of the familiar "heater" shape, varying widely in size. Knights who are illustrated in tournaments usually carry a very small shield, while those in war often carry a larger one. This owes itself probably to the presence of highly dangerous missle weapons on the battlefield, something the tourneying knight did not have to worry about very often. Also, the tournament carries an element of sport that rarely existed in war, so the small shield might also have served to encourage deeds of aggressive prowess rather than defensive boredom for the gallery. Like his other accoutrement, the knight's shield came to take on symbolic meaning. A dishonored knight had his spurs hacked off and his shield hung upside down in disgrace, which insinuates that the shield stood for the honor and renown of the knight, which makes sense since his heraldic blazon, the way he was known on the battlefield or tournament list, was known. Silk: Used in banners, pennants, pavilions, and arming clothes. Skull: The crown of the helmet, the central defense for the upper portion of the head. A casque consists of a 'skull' alone, while an armet or close helmet are built in several pieces, the visor and bevor attached in various fashions. Slag: An impurity in an iron metal, in medieval armours generally composed of iron oxides and silica created when the heated ore reacts with the furnace's clay and stone lining. Smelting: The process through which iron ore is separated from other elements to produce billets of ore useful in the manufacture of metal objects. See also Indirect Reduction & Bloomery Process. Sotheby's: The London and New York auction house that deals in the finest art objects in the world. They produce a special arms and armour catalog, released approximately quarterly, that details the pieces for sale. These catalogs are invaluable in keeping track of the collector's market, and they occasionally feature photographs of pieces not available in museums. See also Armour, buying. Spangen helmet: The early helmets derived from their Roman predecessors, the 'spangen' helmet, popular during the 7th - 11th centuries, consisted of a several small plates of iron or latten bound together with various patterns of banding, all held together with many rivets. A few surviving examples in the Metropolitan Museum of Art show evidence of gold gilding or wash, and there are written references to the helmets of local chieftains being adorned with precious metals and stones. Most spangen helmets were doubtless manufactured locally, since large sheets of *iron plate were hard to come by until the middle of the 14th century. Spatha: The cavalry sword of the romans, between 36" - 40" in length, made from iron. The shape of the hilt is unknown to us, as only a few blades have survived. These blades can easily be confused with their Medieval counterparts, which were of approximately the same length and shape. The Roman footsoldier wielded a much shorter chopping and thrusting sword called the gladius. Spaulder: The 14th and 15th century defense for the shoulder point, featuring a small dished defense for the shoulder point and a number of lames extending down the arm. During the 14th century these lames were generally attached permanently to the rerebrace, but during the 15th century many designs separated the spaulder into a separate piece. As the desire for greater and greater defense increased the demand for full plate protection, the size of the spaulder was increased to cover the armpit and even part of the back and chest, at which point modern scholars have separated out the term pauldron to classify these more extensive defenses. Spear: "The oldest form of staff weapon, intended primarily for thrusting. The war spear usually had a long, leaf-shaped or long, thin, triangular head. "-David Edge and John Miles Paddock, Arms and Armour of the Medieval Knight. In common use during the entire middle ages, the spear ranged in length from five to nine feet, at which point modern scholars begin referring to them as pikes rather than spears. Spectroscopy: One technique used in conjunction with metallography to determine a metal's composition and the techniques through which it was smelted and worked. See Chronique #13, The Knightly Sword. Spur: The y-shaped hardware attached to the heel by straps, the spur was one of the essential tools a knight possessed as an equestrian, and they became on of the dominant symbols of knighthood. Prior to the late 13th century simple "prick" type spurs were in wide use, but during the last two decades of the 13th century and into the 14th the "rowel" spur gained wide popularity. 14th century rowel spurs had a shank ranging in length from two to more than nine inches, with a flared tongue that allowed the spur to ride up the ankle slightly without causing discomfort. Made of bronze, brass and iron, these spurs were probably both cast and forged, depending upon the preferences of the craftsman. Rowels were generally sharp wheels, sometimes decorated with fascinating piercework patterns. 15th century spurs were generally much the same, but during the 16th century the shanks were shortened and more spikes added to the rowel. Spurs were generally attached to the foot with one strap running under the foot and other over the foot, these straps affixed to the spur itself by metal clips that had rings at the other end passing through a hole at the apex of each fork of the "Y" shape. The underside strap was generally made in one piece while the spur was fastened into place in top of the foot using a decorative buckle. Stake: The metal tools over which an armourer hammers sheet iron or steel. There are many shapes of stakes, but most of them are either classified as "mushroom" stakes, "T" stakes, "chisel" stakes, or "horns." See also hammer, and armour, techniques required for building. Stechtarsche: The small ribbed German shield laced to the left shoulder, used in the gestecht, that served as a target for jousts of peace. Sometimes these shields were made of cuirboille, painted or gold leafed to great effect. Steel, as a material for armour: Used in armour chiefly during the 15th, 16th and 17th centuries, steel was occasionally found by accident and incorporated into earlier harnesses. Steel is made by adding carbon to iron, but the process was not applied to plate harness until the early 15th century, although this might prove too late as armouries were secretive in their techniques and there might have been houses, particularly the Missiglian or some of the better German houses, that might have known and used steel rather than iron prior to that. The amount of carbon in steel from which armour was made varies from 0.1% (low carbon) to 0.6% (high carbon). Heterogeneous steels have an uneven distribution of carbon, while heterogeneous steels have a uniform distribution of carbon. Modern mild steels are similar in the amount of carbon present to the lower grade medieval metals, but they are homogeneous rather than heterogeneous. Modern stainless steels have trace amounts of chromium, nickel, silicon, tungsten and vanadium, contain no slag, and polish to a much whiter finish than medieval steels. See also Chronique: The Journal of Chivalry #13. Stuckhofen: A furnace used in the 15th century to smelt steel from iron ore, using a water-powered bellows to increase the heat above the melting point of iron (1550 degrees C). See also Bloomery Process and Chronique: The Journal of Chivalry #13. Sugarloaf: A transition helmet between the heaulm and the bascinet where the skull of the helmet was pointed like a bascinet and the sides enclosed like a heaulm. Both were worn until the third quarter of the century, when the visored bascinet emerged as dominant. Sugarloafs were often adorned with a cross of brass, bronze or latten across the front and decorated with torses and mantles, especially since they were frequently worn in tournaments and in jousts. Surcoat: A cloth covering usually worn over the body armour. During the 14th century they were gradually shortened from their 13th century lines. They started during the first quarter of the century ending at the knee, and ended the century ending at the edge of the hip. During the 15th century they were shortened further, and eventually abandoned in favor of a large tunic worn over the cuirass. The addition of white armour made the use of a surcoat less important, as full harnesses were generally somewhat individual. Most surcoats were emblazoned with the cote of arms or device or the wearer in order that they identity be known in the crush of battle. Sword: The predominant weapon of the knight; a long, tapered, usually two-edged blade ranging from 32" to more than 72" in length ending in a point which was sometimes, but not always, used for thrusting. For most of the period from the 9th century to the end of the 15th century, the broadsword remained the mainstay weapon for knights, squires and men-at-arms. Swords generally weigh less than popular culture would have you believe; the finest weapon I have handled was one purported to belong to Edward III; it was nearly 40" in length and weighed in at only 3 1/2 pounds. The pommels on many swords are thicker than they appear in most two dimensional illustrations, being heavy to counter the blade. The sword also came to possess strong symbolic meanings, different virtues being assigned tot he two edges. The quillion (a 16th century term) or cross-piece formed across the handle of the sword resembled a Christian cross, furthering the symbolism. See also bastardsword, claymore, and Chronique: The Journal of Chivalry #13. Tasset (Taces): The 15th century defense for the hips that attached to the fauld. Usually a plate of iron or steel, often featuring one or more fluted ribs and a thick rolled edge (at least in the front) for strength. Uncommon during the 14th century; an integral part of most 15th century white harnesses. Torse: A colorful cloth roll worn around the crown of the helmet, from which the mantling or cloth decoration was attached. Used from the 13th century through the 15th, torses and mantling helped to identify the knight in war and provided a colorful expressive tool for tournaments and pageants of the 15th century. Tower of London: The most famous armour museum in the world. The museum houses what is arguably the finest collection of armour in the world, including several very fine visored bascinets, several 15th century harnesses, and an extensive collection of pieces from the 14th and 15th centuries, in addition to the very large collection of later equipment. Transitional armour: Armour of the transitional period, when mail defenses were gradually augmented during the development of a full plate harness. Transitional Period: Corresponding roughly to the 14th century, it was the period directly in between the use of mail and casques and the international adoption of full plate during the 15th century. It was a time of broad experimentation in terms of materials, engineering techniques, and preferred zones of defense. Most of the adornment in transitional armour is expected to be found in the elegant simplicity of the pieces, and in the interplay of colors between the fabric, leather, and metal contrasts. Also characterized by a very athletic line, including the emphasis of the "wasp-waisted" look for the body and slender appearance of the limbs. The transitional style affects a study in complimentary colors, heraldic displays enhanced with metal to add to the sense of martial seriousness. Valerius School: The modern school of armourers established within the SCA under the founding partners Aaron Toman (AKA SCA Count Valerius Paencalvus, Knight, OL-Middle Kingdom) and Wade Allen (no longer in the SCA). The first armourers in this country who were successful at blending artistic quality with historical accuracy and safety on the tournament field. They taught a small generation of armourers who followed them, all of whom attained the rank of "laurel" in the SCA. These in turn have spawned yet a third generation, who are currently very active in the SCA armour world. "Valerius" pieces are known for being of very high quality, highly durable, highly polished, and to have a very sleek line, in addition to being extremely accurate in terms of historical style. Vamplate: The metal or leather guard for the hand or arm on a lance. Such are nicely depicted in an illumination depicting a joust of war between Sir John Astley and Pierre de Massey. Ventail: (see also aventail) These were mail or plate skirts attached to bascinets to defend the throat during the latter half of the 14th and to the mid 15th century. Vervelles: Bronze, brass or latten "staples" that attached to a bascinet to enable the leather cuff of an aventail to be secured to the helmet. Visor: Protection for the eyes and face, affixed to the helmet from the side or top center. On a bascinet, the visor is known as a klappvisier, or hundskul. Waffensamlung, Austria: The extensive collection in Vienna, featuring a very large and high quality collection of Gothic and Maximillian armours. See also Armour, collections. Wallace Collection: The collection in London featuring a wide variety of equipment. The prize piece in the collection is a full harness for horse and man of Gothic armour, one of the finest examples to be found anywhere. See also Armour, collections. The Wallace Collection, Hertford House, Manchester Square, London, W1M 6BN. Visit their Website at http://www.demon.co.uk/heritage/wallace. Whalebone, evidence for use as a tourney weapon: In the 1278 accounts of Edward I for the tournament held at Windsor, weapons of whalebone are mentioned alongside the cuirboille armour intended for the tourney. See also Behourds. White Armour: The first complete cap à pied (head to foot) armours, popular during the 15th century. They were made chiefly in Italy and in Germany, two of the armouring capitals of Europe and exported throughout the continent. The name comes from the very high glossy white polish that was often put on the armour to protect it from rust and the elements. Wing: The extension on a poleyn or couter to defend the joint of the knee or elbow, respectively, coming into use after 1350 or so. See also Arm harness and Leg harness. Wrought iron: Iron relatively free from carbon and other impurities. Produced through the reduction of iron ore, or through the refining of cast iron.